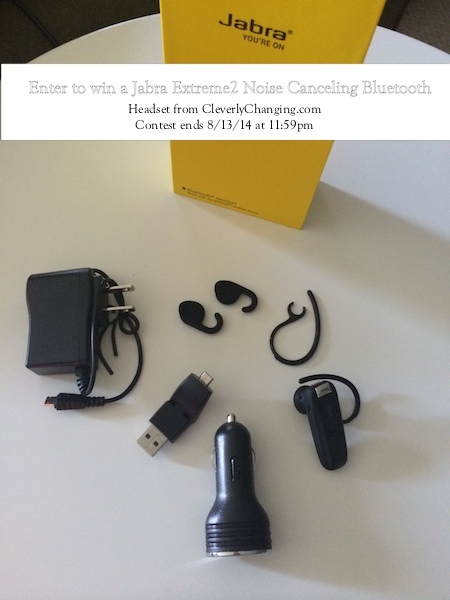 Thank you Jabra for sponsoring this giveaway! The Jabra Extreme2 noise canceling Bluetooth headset should work with any Bluetooth enabled device. According to its overview, you can feel free to talk anywhere, anytime; less fumbling around with it; great wearing comfort; and it connects quickly and easily. It has five and a half hours of talk time and 10 and a half days of standby. It adjusts the volume according to the background noise automatically. It also has the ability to download your phone book and tell you who is calling. It does connect quickly and easily. Simply put it on and turn on both the Jabra and the device’s Bluetooth and follow the prompts. It took me less than one minute to connect my iPhone. Now it is recommended that you charge your headset prior to using it, but I found that there was enough power straight out of the box for me to set it up. I did however charge it for about 45 minutes or so after making my initial 10-minute call. In terms of noise reduction and hearing, I think it works very well. Not only could I hear clearly with a crying, teething baby at my leg, I was also heard fairly clearly on the other end. There was little to no, “Say that again,” or “What did you say?” Usually when I call a certain someone, I have a hard time hearing because it sounds like they are in water or something like that. It still sounded like that—I’m pretty sure it is her phone as I don’t have this issue with anyone else. My second call was uneventful and there were no problems at all. These calls were made inside my home. I have also tried the Jabra Extreme2 in the car. I rolled all of the windows down and had a successful conversation. I turned the A/C on full blast and also had a successful conversation. I’ve used it at the sports complex where there is plenty of noise and action, and I was still able to hear and be heard without any problems. It works well at shorter distances. I was doing more listening than watching of a video on how to add calcium to plants using vinegar and egg shells when I decided to take the trash to the dumpster. I left my phone in the kitchen, walked down several flights of stairs, and outside. I would estimate that I was about 500 feet from my phone when it cut off—“Disconnected” is what I heard the Jabra lady say. By the way, she is a little loud; or maybe not, I just have sensitive ears that hear things I’m not even trying to hear. I don’t think the volume button located on the headset adjusts the Jabra lady’s volume—I really wish it did. I just don’t put it in my ear until a few seconds after I turn it and my device’s Bluetooth on. There’s nothing I can do about her announcing phone calls however. I do find that the over the ear hook/clip makes my ear hurt after longer periods of wearing. I’m not sure if this is due to the shape of my ear, but I don’t wear it for more than 30 minutes at a time unless I am actually using it. I haven’t tried any of the optional earpieces that came with it yet, but I will. I would recommend this Bluetooth headset. You don’t have to touch your phone to operate it. There are two buttons on the headset. It works well with Siri. It updates you on its battery status. There is a physical on/off switch and volume control on the headset.